Crooked Brook Chef Coats These chef coats are not kept in stock, each one is made to order to your style, fit, and fabric specifications. You may order a chef jacket or cook shirt the way it appears, or you may combine the different options (fabric, buttons, pocket, collar, cuffs, sleeves and piping) to create your own design. Crooked Brook Women's Chef Coats Our women's chef coats have been designed and crafted to fit the shape of a women's body. Knowing that not all women have the same proportions, we also offer all our chef coats in combination sizes, as well as maternity sizes. 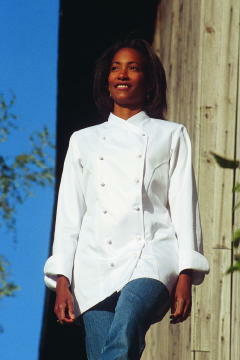 Women's chef coats are available with all the same customizing options as the above jackets. Discounted Chef Coats Here are the images and descriptions of discount Crooked Brook chef coats. They are first quality chef coats that were SNAFU's or used for photography. First come, first served, so please call or e-mail for availability before ordering. Sold as is. All sales final. Don't forget the Chef Wear! !